The Joby Gorillapod line of flexible tripods is both fun and practical for getting your camera on a firm foundation for a great shot. Bend the legs as crazily as you need in order to get a solid set-up, whether perched on a rough surface with its rubberized foot graps, or wrapped around a handy pole or tree branch with its fully flexible leg joints. The Gorillapod line already came in three sizes, for compact digital cameras (under 10 oz., $24), lightweight SLR cameras and camcorders (up to 1.75 lbs., $44), and tripod-mountable cameras (up to 6.5 lbs., $54). And now there are two more options for even smaller or larger devices. The Gorillapod Focus (leftmost above) is for even larger professional camera rigs with large zoom lenses, and video cameras (up to 11 lbs., $139). And the Gorillapod Go-Go is for smaller compact digital cameras, as well as supporting handheld devices including cell phones, PDAs, and music/video players, so you can watch them without having to hold them ($34). The Go-Go comes with three attachment options: suction cup for flat surfaces on the device (holds up to 7 oz. ), stick-on adhesive clips (up to 10.5 oz. ), and traditional camera screw clip (up to 11.5 oz.). See my Digital Cameras Gallery for more on these and other tripods. Combining "fashion-conscious style and audio-enthusiast sound," the V-MODA Vibe Duo is a noise-isolating dual-use headphone that's also a headset with the integrated hands-free microphone. It's lightweight, with a solid alloy composition and 32-inch black fabric cable. The subtle design also includes touches like a small music/call button on the mic to switch between listening to music and talking on the phone, the plug mounted with the cord angled at 45 degrees for strain relief, and texturing of the earpieces for a better grip. The package includes three sizes of earpieces in soft silicone. The resulting sound is strong but not distorted. It features V-MODA V-MASQUE dynamic driver technology for a "precise yet natural soundstage," plus BLISS (Bass Level Isolating Soft Silicon) technology to reduce ambient noise and enhance the bass response. 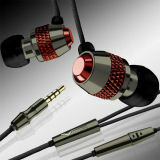 See my Portable Audio Accessories Gallery for information on headphones and earphones. Some like it hot. Some like it cool. We all have our own individual preferences on how we listen to music -- which also depends on the type of music, from cool jazz to hot rock, vocal to orchestral, simple unplugged to deeply layered. As you experiment with different speakers and headphones you can find your favorites that match the acoustic profile for what you're listening to, and how you want to listen to it. Or, you can get earphones that let you customize the sound of music, like the Sleek Audio SA6 acoustically adjustable in-ear earphones. These feature Sleek's tunable VQ technology, with interchangeable bass and treble tuning elements. The interchangeable tuning ports are small cores that are inserted in the back of the earphone (bass) and under the ear tip (treble). The three tuned bass ports (plus, neutral, minus) are speced to provide 10 dB difference at 20 Hz for low frequency. And the four treble ports offer sustained high frequency or smoother response with less upper high end, a new extended high frequency element. The product also includes three pairs of noise isolating soft ear canal tips and a 50-inch detachable cable that can be worn in three ways: with the cord up over the ear, or down, or worn upside down with the cable lying at the cheek for small ears. The Sleek Audio SA6 is available for around $299. Today's LED flashlights are light and rugged -- and bright, like the Duracell Daylite LED Flashlight (see previous post). Energizer also has an extensive line of LED flashlights, for home, work, pro, outdoor, kids, and on the go. For example, the Energizer Hard Case Work line is designed to provide rugged and dependable lighting with bright LEDs, shatterproof lenses, and tough cases, with a selection of models designed for different numbers and sizes of batteries. The Energizer Hard Case Professional line then features designs for specific professional needs, including lanterns, headlights, and spotlights. For example, the Energizer Hard Case Professional 2AA Swivel Light features a rotating swivel head (125 degrees) and a choice of lights: the main high intensity white LED, two red LEDs for night vision, and a green LED for pipe inspection. The LED produces 80 lumens of light, and is rated for a 4 hour run time with the included two AA Energizer Max alkaline batteries. It fits comfortably in the hand, with impact resistant plastic with rubber fittings and grips, and a shatterproof lens that survives a 20 foot drop. The Swivel Light is available in 2 and 4 AAA battery models for around $29. See my Portable Power Accessories Gallery for more details. Watching Internet video on your computer is great, with amazing stuff on YouTube and network shows on Hulu.com. But sometimes there's use for old fashioned broadcast TV, especially for breaking news, live sports, and new episodes of favorite series -- when you're traveling, or just want to watch some TV in a cramped home office or dorm room. So hook up an antenna to your computer, and start watching. OK, you'll also need some TV tuning hardware, which can't get much smaller then the new Pinnacle PCTV HD mini Stick -- A compact USB dongle only around 2 inches long. Connect the HD mini Stick to the included telescopic TV antenna, install the Pinnacle TV software, and you're watching digital over-the-air TV (ATSC), standard-definition SDTV and high-def HDTV up to 1080i. 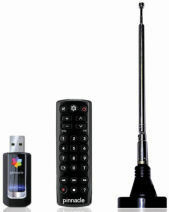 The stick also can connect to your cable TV to watch unencrypted digital cable (ClearQAM). But the Stick does not work for legacy analog broadcast TV (NTSC) -- which is due to be turned off in February 2009 anyway in the last step of the Digital TV Transition. The somewhat larger PCTV HD Ultimate Stick (see previous post) supports both analog and digital TV, plus Clear QAM -- and the software runs directly from the device, with no installation required ($129). The PCTV HD mini Stick pulls in great-looking TV with the included antenna, including full-screen HDTV -- as long as you are in range of digital broadcast signals (see AntennaWeb.org), and you have a recent computer with enough processing power. There's even a mini remote control to help you sit back and enjoy and a program guide to see what's on. The Pinnacle software also supports TV recording / time-shifting (pause and rewind) [but not HD], and TV recording straight to DVD. The product also includes Pinnacle VideoSpin to trim recorded clips. The Pinnacle PCTV HD mini Stick is $119 for Windows, $129 for Mac. See my Home Media Gallery for more on PC TV and video in the home. The CD is fading away as a purchased music format, and digital music is growing, but it's still clumsy to manage digital music files -- rip or purchase songs, keep them organized, and then sync or download to the desired mobile phone or portable players. So maybe there's still a place for a new physical purchased music format -- the SanDisk slotMusic card, available this holiday season with more than 40 "albums" from major labels: EMI Music, Sony BMG Music, Universal Music, and Warner Music. The slotMusic format is just a standard microSD card, preloaded with music (plus additional content such as liner notes, album art, and videos). A typical "album" on a 1 GB slotMusic card contains some 12 songs, and sells for around $14.99, much like a CD. The music is in standard MP3 format, with good quality up to 320 kbps. And it's DRM-free, without any copy protection, which means it should play on pretty much any device. You can copy and play the music files on other devices (including a PC -- they are packaged with a tiny USB adapter). And you can copy your own files to the slotMusic cards -- again, they're just a standard microSD card preloaded with MP3 and other files. SanDisk also has released an accompanying dead simple player device -- the SanDisk Sansa slotMusic Player. It just plays MP3 and WMA music files from the microsSD slot -- there's no internal memory and no display. But a 16 GB card can hold up to some 4,000 MP3 songs, which can keep you occupied for a while. The player is small, under 2 ounces, and only $19.99. I'm a big fan of the Pure Digital Flip line of portable camcorders, and particularly the minimalist Flip Mino (see previous post) -- It's small enough to carry almost anywhere, and shoots good-looking standard-definition video. Most recently I shot some fun video of a high school football game at night, and some even more entertaining close-ups of the bedraggled cat getting a bath -- all of which look quite good, especially for video shot with a tiny 4 x 2 x 1/2-inch camcorder that weighs 3.3 ounces and costs around $179. 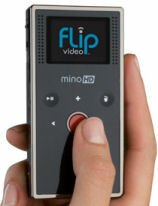 But if the Mino was amazing, wait until you see the just-released Flip MinoHD -- It's the same design, the same functionality, but now it shoots HD video (720p), and is priced at $229. And when I say the same, the MinoHD really is the same size as the original Mino! It's just that the imager is upgraded to HD resolution, and the memory is upgraded from 2 to 4 GB, in order to still store an hour of video. The MinoHD also comes with new FlipShare software that can be installed directly from the device, after connecting the pop-out USB arm to a Windows or Mac system. Then drag-and-drop to view, organize, edit, and share your clips, including online publishing to YouTube, MySpace, or AOL Video. And you can use the Flip customization service to design your own personalized case (see previous post). See my Digital Camcorders Gallery for more on the Flip line and digital camcoders. Adobe has just released trial versions of the applications in the Adobe Creative Suite 4 product family (see previous post), which are available online for download. Or you can order a trial DVD of the complete Creative Suite 4 Master Collection for $15.99. See full article: Summary: Adobe Creative Suite 4 for a summary of the CS4 suites and individual applications. See summaries of video applications and versions in my Video Editing Software Gallery. On of the less flashy pleasures brought by our connectivity to the Web is Internet Radio and music services -- that can deliver our favorite music anytime and anywhere, to a PC, portable player, or cell phone. 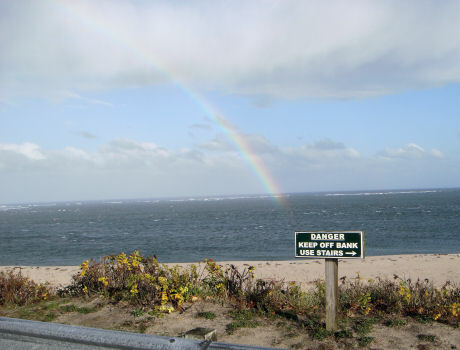 Internet Radio stations are often existing radio broadcasters that also stream their signal over the Web (see Wikipedia article - and list of stations). Services like Live365 provide convenient listings to explore the thousands of available stations, searching by genre and location. Instead of listening to a specific radio station, other services like Last.fm are more focused on helping you customize your own listening experience. With Last.fm, you develop a profile of your interests which connects you with other people with similar interests. You can start with specific stations, genres, or artists, as well as preview individual tracks. Then explore your individual interests, personal recommendations and similar artists from Last.fm, as well as shared music from other users and groups. Or connect to Slacker Personal Radio, choose your genre and style, and listen for free (albeit with ads). Even better, you can explore new music and then customize your own stations to enjoy just your favorite styles and artists (and ban those you don't like). It's still like listening to a radio playlist, except you can really customize the type of music, and see the playlist so you can skip ahead over individual songs. Slacker offers more than 100 expert-programmed stations, plus over 10,000 artist stations. And this is the full range of music -- Slacker has licensing agreements with all the major record labels, as well as thousands of independent labels. But these licenses require a radio-like experience -- you can't skip backwards to replay a specific song, although you can pause playback. Slacker also has recently introduced the Slacker G2 portable player that automatically refreshes your favorite stations over USB or Wi-Fi so you can listen on the go. It's $199 for 4 GB / 25 stations / 2500 songs, $249 for 8 GB / 40 stations / 4000 songs -- plus space for personal storage. You also can sign up for the Slacker Premium Radio service to avoid the ads ($7.50 to $9.99 a month), request specific songs (like calling in a request to the DJ), and save favorite songs to listen to later on the computer or the Slacker player. Also try Pandora Radio, which creates personalized radio stations that play music related to your favorite artist, song, or composer -- choosing music with similar music styles based on the Music Genome Project. Be sure to check out the explanation of why each song was selected, to see the musical details that match your original selection. You can register for free to save your stations, and share stations with other listeners. Pandora also is available on cell phones from Sprint and AT&T, including the iPhone. and on home players including the Sonos and Logitech Squeezebox. Pandora also is ad-supported, or subscribe for ad-free listening ($36 a year). Maybe it's time to rediscover the joy of music, and find some new favorites. Internet radio and music services are a great way to enjoy your types of music, discover new music related to your favorites, and even customize your own stations with specific styles and performers (see previous post). And you can listen on any connected computer, and on the go on portable devices and cell phones. But what about listening in other areas of the house, like the bedroom or porch or even the backyard? You don't want to have a computer in each room, or lug around a laptop just to listen to music -- and you want to be listening on some good speakers anyway. One answer is the Logitech Squeezebox Boom, a portable boombox radio for $299 that connects to your network to play Internet radio stations and other online music services. The Squeezebox Boom is an all-in-one network music player, with an integrated amplifier and high-performance speakers. There's no antenna, no AM and FM broadcast stations. Instead you connect it to a wireless (or wired) network and "tune" by selecting the music source (i.e., Internet radio station or online music service) and options under that source, and then listen to the streaming audio from that source. To set up the Squeezebox Boom, you need to go on the Web to Logitech SqueezeNetwork site in order to register your device's ID. You then can access thousands of Internet radio stations, by genre or location, or based on staff picks or listener popularity. And you can sign up for free music services including Pandora and Slacker, and set up trial subscriptions for services including Last.fm, Live365, MP3tunes, Radio IO, RadioTime, Rhapsody, and SIRIUS. The setup process tries to simplify this process by automatically generating logins for you at these sites, but this obviously is a bit more complicated then using an AM radio. For example, the default setup process failed for me (I already had a login for one site, and another objected to my zip code). As a result, the radio displayed terse error messages when I tried to access these services. You also can download the Logitech SqueezeCenter music server software to install on your home computer so the radio to access you own personal music collection and playlists (in addition to the online stations and services). The Squeezebox Boom features a 30-watt amplifier with two 3/4-inch, high-definition, soft-dome tweeters, and two 3-inch, high-power, long-throw woofers. The back connectors are Line-in for listening to other music players, and headphone out that also can be used for a subwoofer. The interface works though a several-line menu on the front display. The box also has six preset buttons (as well as a Favorites menu), works as a clock and 7-day alarm clock, and includes a small remote control. The bottom line: Once you've configured your network connections and online services, the Squeezebox Boom provides a turn-key way to enjoy streaming music from a variety of sources. Just be aware that this is not a simple radio, and requires a certain amount of technical knowledge and resilience to get it configured and working with the different sources. For example, it's a bit surprising when you first see a radio turn on and immediately display an "Obtaining and IP address" message. Also, the device was very unhappy when used on a weak network connection, failing to resolve with the DHCP server, stuttering and restarting when trying to play (with rebuffering error messages cut off on the display), and then becoming unresponsive and even resetting itself back to the setup configuration process. But once set up cleanly, the Squeezebox Boom was easy listening. See my Home Networked Media Gallery for more on the Squeezebox line and related networked media products for the home. Microsoft has cut prices on its flash-based Zune players and accessories for the US and Canada -- the Zune 4GB is now $99 (was $129), Zune 8GB is $139 (was $149), and Zune 16GB is $179 (was $199). The Zune 3.1 software update also is available. This is an incremental update, improving overall stability and performance in the Zune PC software and device firmware. It's sweetened with three new games, Checkers, Sudoku, and Space Battle, plus a new multiplayer mode and single player difficulty levels for Texas Hold’em. The PC software has a refresh to Zune Social, so it's easier to navigate, and adds a new “like minded listeners” feature so you can see how compatible your music tastes are with other listeners. Just connect your Zune to your PC, and the Zune Software will guide you though the process of downloading and installing the upgrade. See the ZuneInsider blog for further news updates. See my Portable Media Players Gallery for more on the Zune players and software, and the development of related products. 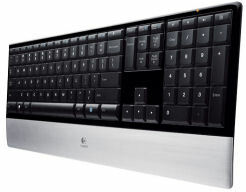 Logitech has introduced both PC and Mac versions of its Logitech diNovo Keyboards for Notebooks. These are thin and stylish wireless keyboards designed for easier typing and more efficient one-touch functions while you're using your notebook at your home base. The diNovos are full-size keyboards, with integrated number pad and programmable function keys, including keys for media playback and volume control. The Mac keyboard layout has 19 F-key shortcuts for one-touch access to Mail, Safari, iTunes, Exposé, Cover Flow, Dashboard, QuickLook and Spaces. The elegant design has a slim profile (0.87 inches from base to key caps), with piano-black finish and brushed aluminum palm rest. But the PerfectStroke key travel is actually longer than typical notebooks, with an even press even if you strike the edge of the key. And the feel of the device is solid, at around 2 pounds. The product includes a mini-receiver dongle to plug in to your notebook's USB port for the 2.4 GHz wireless technology. And it runs on 4 AAA batteries for up to 3 years. Both the PC and Mac versions of the Logitech diNovo Keyboard for Notebooks are available for around $99. See my Portable Peripherals and Accessories Gallery for more fun devices, organized by company. Someday all our devices will be wireless, and our files and media will just be there whenever we want them. Even today we can see the beginnings of connectivity for sharing photos, with camera phones that automatically upload photos to online sites, digital photo frames that automatically update with new images, and portable players like the Microsoft Zune that sync wirelessly to update with new media. But we still need to cable our digital camera to a computer (or pop a memory card) in order to save our stored photos, and then be able to upload them to share on online sites. Or -- turn your digital camera into a wireless device with the Eye-Fi Wi-Fi SD Memory card. This is a standard 2 GB SD memory card, plus built-in Wi-Fi networking (see previous post). - Eye-Fi Anniversary Edition ($129) - Like the Eye-Fi Share for uploading over your home network to a computer or online sites, but now with 4 GB of storage. Available only at Costco.com for $99 to club members, or from Eye-Fi for $129, while supplies last. - Eye-Fi Share ($99) - Adds uploading to online sites over your home Wi-Fi network. Eye-Fi supports more than 20 photo sharing, printing, blogging and social networking sites including Apple MobileMe, Costco, Facebook, Fickr, Kodak Gallery, Nikon My Picturetown, Picasa, PhotoBucket, RitzPix, Shutterfly, SmugMug, Snapfish, and Wal-Mart. The Lexar Shoot-n-Sync Wi-Fi Memory Card also is available, combining Lexar memory card technology and Eye-Fi wireless technology. Like the Eye-Fi Share, it's 2 GB, and transfers photos to computer and online sites over home Wi-Fi network. The new 3M MPro110 Micro Professional Projector is a portable video projector that literally fits in your pocket. It's around the size of a digital camera, a bit smaller than a Palm Treo at around 4 1/2 x 2 x 3/4 inches and 5 1/2 ounces. Just hook it up to your notebook computer, DVD or MP3 player, or handheld video game system and project the image up to around 6 feet, for a big 50 inch diagonal display. Yes, it's not super bright at around 8 lumens, but you can still see the picture clearly as long as the room is not flooded with light. So now you can carry a video projector to share your fun anywhere (OK, or business presentation). Just project on the wall, or a piece of poster board -- or on the ceiling to add ambience to the room. There's a focus knob on the front to adjust the picture from around 1 to 6 feet. And a tripod mount for stabilizing the display. The MPro110 uses a LCOS imager with LED light, which means it runs cool (no need for a fan), and long (10,000 hours, so no worry about replacement bulbs). The battery runs for 40 to 60 minutes. The display itself is 640 x 480. The MPro110 comes with a VGA cable for displaying from a notebook (it accepts higher resolutions), and a RCA cable for displaying NTSC and PAL video signals. The 3M MPro110 Projector lists at $359, and is already available for around $300. Also keep an eye out for the Optoma PK-101 Pico Pocket Projector, due around December for $399, which uses DLP technology (tiny mirrors), is a little smaller (4 x 2 x 3/5 inches, 4 ounces), and includes speakers and an iPod kit. Digital photo frames were a big hit for last year's holiday season. For this season, the Consumer Electronics Association again lists them in the top 10 CE accessories that consumers expect to purchase as gifts. You can get big photo viewers with fancy frames to show off your high-res photos, and even networked frames to update the stored slide show over the Internet. And with advancing technology and falling prices, photo displays can be built into all kinds of interesting products. 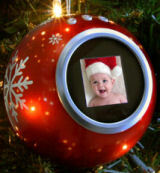 For example, the Nextar Christmas Ornament Digital Photo Frame is small and light enough to hang from a tree (3.3", 8.8 oz. ), or can sit on its built-in stand. It displays slide shows of up to 60 photos on the smallish 1.5” screen, and is available in red and green for around $19.99. Hook it up to a USB port with the included cable to run the built-in software stored in the internal memory (PC and Mac), which is required to transfer photos. The ornament is powered with two AA batteries (also included). Nextar's CE products include more digital photo frames, portable media players, portable navigation systems, and Bluetooth devices -- including holiday-themed Snowman and Santa photo viewers for $29.99. See my Digital Cameras Gallery for more on camera accessories. 'Tis the season to bulk up on storage for the holiday season -- for your digital camera, camcorder, game player, or other portable devices. After all, why worry about carrying extra cards to swap in when one fills up, when you can just get a bigger card that can hold all your stuff -- even the full set of your holiday photos or hours and hours of video. The SDHC format (SD card, High Capacity) blew away the now-pathetic 1 or 2 GB capacities of just a couple years ago, expanding the SD card format to 4 to 32 GB, with the bonus of faster data rates to support the demands of fast-shooting 10+ megapixel digital cameras and high-def video. And as storage continues to re-double in size, that promise has come to fruition this season with 16 and now 32 GB SDHC cards, plus 8 and 16 GB microSDHC cards, from SanDisk and Kingston. The new Kingston 32 GB Elite Pro SDHC card is listed at a premium of $293, as 16 GB cards have fallen to around $40 to $60, and 4 and even 8 GB have fallen under $20 (even for some higher-speed cards). Meanwhile, the ridiculously small microSD cards, designed for use in tiny mobile phones, are only a step behind. The SanDisk 16 GB microSDHC card lists at $99, with 8 GB for $49, 4 GB for $29, and 2 GB for $19. While the highest-capacity cards may not be generally available yet, they help continue to drive ongoing price reductions. While 1 GB cards were priced around $60 two years ago, we're now looking at under $10. Prices vary dramatically this season, so stay alert for better deals. For example, the SanDisk CyberMonday sale is running through, well, Monday, on memory cards, USB drives, and MP3 players. One interesting byproduct in this dramatic growth in storage capacity is that the SDHC format already has hit its limit of 32 GB after just a couple of years on the market. But there's still some time to adjust as these new sizes become more popular. In addition, just as the new SDHC format required changes to devices to support the higher capacity, some current devices still may require driver upgrades to handle the new 16 and 32 GB sizes. Entries posted to Manifest Tech Blog in November 2008, listed from oldest to newest.